"Authentic Bolognese sauce is slow-cooked to perfection, and then spread over fresh lasagna noodles covered with béchamel sauce. 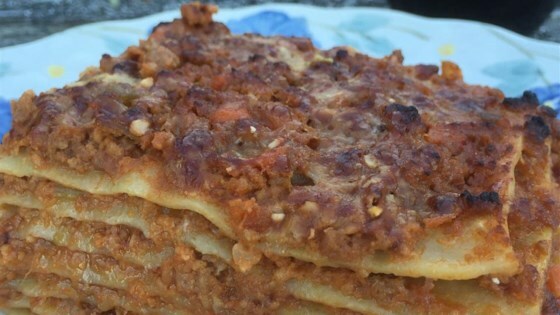 This is the best and only lasagna recipe you will ever want. For better results, always use the highest quality ingredients available, from the salt to the meat and wine." Heat olive oil and 1 tablespoon butter in a large Dutch oven over medium heat. Add pancetta; cook and stir until browned, about 8 minutes. Add celery, carrots, and onion; cook, stirring occasionally, until very soft, about 15 minutes. Stir in beef and pork. Season with salt and pepper. Cook until evenly browned, about 20 minutes. Pour white wine into the Dutch oven; cook until alcohol evaporates, about 5 minutes. Stir in crushed tomatoes, tomato paste, and sugar. Bring to a simmer; reduce heat to low, cover and simmer Bolognese sauce, stirring occasionally and skimming fat off the surface, about 3 1/2 hours. Stir in beef broth, 1/4 cup at a time, if sauce looks dry. Stir heavy cream and 1/2 cup milk into the Bolognese sauce; mix well. Cover and cook over very low heat until flavors combine, about 30 minutes. Melt 5 tablespoons butter in a large saucepan over medium heat. Stir in flour until a smooth paste forms; cook and stir until paste turns a golden sandy color, about 7 minutes. Increase heat to medium-high and slowly whisk 4 cups milk into the saucepan. Bring to a gentle simmer; reduce heat to medium-low and add bay leaf. Continue simmering, stirring occasionally until bechamel sauce is thick and smooth, about 10 minutes. Season with salt and nutmeg; discard bay leaf. Preheat oven to 350 degrees F (175 degrees C). Grease a 9x13-inch baking dish with butter. Spread 1/4 cup bechamel sauce in the bottom of the baking dish. Cover with 1 lasagna sheet; prick in several places with a paring knife. Spread 1/2 cup bechamel sauce and 1/2 cup Bolognese sauce on top. Sprinkle 1/4 cup Parmesan cheese on top. Repeat layers 7 times with remaining lasagna sheets, bechamel sauce, Bolognese sauce, and Parmesan cheese. Cover lasagna with aluminum foil and place on a rimmed baking sheet. Bake lasagna in the preheated oven until bubbly, about 25 minutes. Remove aluminum foil and continue baking until cheese is browned, about 20 minutes more. Let cool before serving, about 15 minutes. Sometimes I like to bake the sauce, covered, for 3 1/2 hours at 275 degrees F (135 degrees C) for a deeper flavor. After that, I take it out, add the milk and heavy cream, and finish simmering it on the stove. Remember to always prick each pasta sheet when assembling the lasagna; this prevents air bubbles from forming when baking. To prevent sticking, either butter aluminum foil or make sure it does not touch the cheese.